I'm posting here mostly to have a bit of a moan and secondly to see if people out there have shared my experiences. I am fairly familiar with modelling in Solidworks however recently I've needed to use Max to animate and render. To be honest I am completely frustrated with the fact that the modelling skills I've learned in Solidworks don't translate well into Max. I understand they are different programs from different publishers with different intended uses. As people here may have experienced, .iges files do not react well when exported from Solidworks and brought into Max, resulting in crashes and odd behavior galore! I have plans to test whether using .STL files will work. Anyway, if that doesn't work I'll have to accept defeat and begin the process of learning how to model from scratch in Max. My experience with modelling in Max isn't great. I am so familiar with the concept of turning sketches into 3d geometry in Solidworks that Max feels completely alien to me. I must be missing lots of the conceptual building blocks because when I try to create even simple geometry with Max I hit walls quickly. 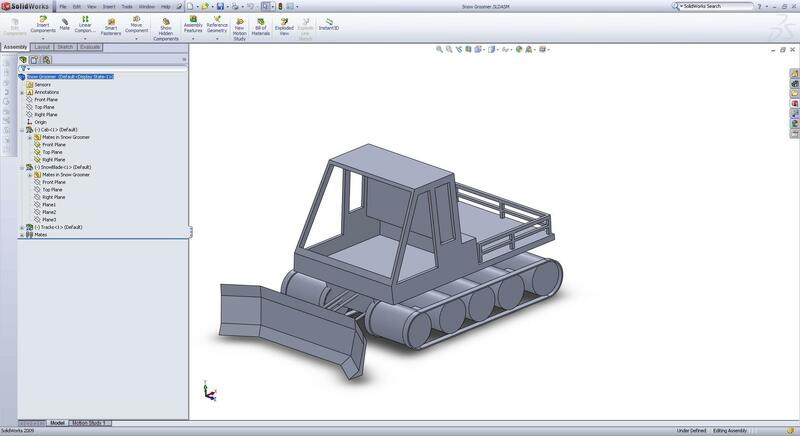 Solidworks offer flexibility where you can go back and change your designs. By contrast I feel like I have far less control and also accuracy in Max. Now I freely admit knowing very little about Max, so I'm interested to hear other's thoughts and experiences. Is it worth my while learning to model in Max or should I stick with trying to import solidworks files? My gut tells me Max needs native files to run propperly without crashing. If you will describe your modeling process in SolidWorks I will try to describe the closest 3d modeling process available in 3ds max. You can do it with Splines, with Nurbs or with Polygons. What do you use to model in SolidWorks? Theoretically .stl should import well in 3ds Max. Thanks Andyba, that would be amazing. My solidworks model is very simple and uses extrudes, extruded cuts and reference planes mostly. There is a "shell" done to hollow out the cab. In 3ds max you can do the same things. Create a cube than transform it to editable poly and use extrudes, edge cuts and shell modifier. If you are used to modeling from sketches and used to creating models from driven constraints and dimensions stick to solid works or inventor. 3ds max, maya, softimage xsi etc. are completely different programs (obviously) and require a different modeling strategy since they work from primitive objects. As an engineer/ industrial designer those programs are good for rapid visualization if you can get the hang of them but they aren't good for CAD prototyping. Another good program that meets sort of in the middle is Alias, which I've tried and seems really powerful. Overall I'd say that 3ds max and those similar programs are better for getting realistic renders inside of the program while the CAD modeling programs like solidworks are better for getting usable models for production. So it depends on what kind of end product you are looking for. Personally I use Inventor everyday and achieve very complex models and I use a 3rd party program for rendering (bunkspeed shot) and the results I get are perfect life like images. But if you want to learn how to get that in 3ds max you should look into tutorials, like those from gnomon workshop or digital tutors. Also, I'm curious why you are trying to import models from solidworks into max. Are you just using max for rendering or animation? If so then definitely give bunkspeed shot a try you'd be doing yourself a disfavor if you didn't. Well actually yes, that pretty much exactly what I'm doing. I am familiar with 3dsmax for creating materials, lighting, camera motion etc. I am now looking into rendering large solidworks assemblies. I was hoping to use my 3dsmax knowledge to help out with this. I have heard a few people talk about bunkspeed, which looks interesting. I am torn between abandoning 3dsmax and diving into bunkspeed. I hear it's relativelty simple though. Another option is the Photoworks360 program which comes native to solidworks for a fee. Does anyone have any advice on whether I should stick with Max for rendering SW assemblies or abandon the time I've invested in learning it? Any thoughts on the best way to get quality rendering from solidworks?